I am a person driven by routine. I’ve more or less eaten the same breakfast for the last few years – the mundane egg accompanied by a piece of fruit or bowl of yoghurt. It’s not the most inspired of breakfasts. Rather, it’s a breakfast filled with convenience and ease. A breakfast I can thoughtlessly prepare whilst I, still bleary eyed, shake the lingering effects of sleep from my body. Recently though, I have ventured into new and undiscovered breakfast territory. Granola. The idea of topping my morning bowl of yoghurt with something textural, nutty, crisp and oat-y seemed rather appealing. So I made a batch. And loved it. I may have discovered a replacement for my bland, habitual breakfast. Rose Petal Granola with Pecan and Cacao Nibs makes for a perfect and robust breakfast. Toasted oats, currants, pecans and cacao nibs form the base of this granola - giving it a delicious, nutty crunch and hearty texture. The sweetness comes from a mixture of melted butter, vanilla and honey, whilst the addition of dried rose petals adds a further floral-y sweet tone. 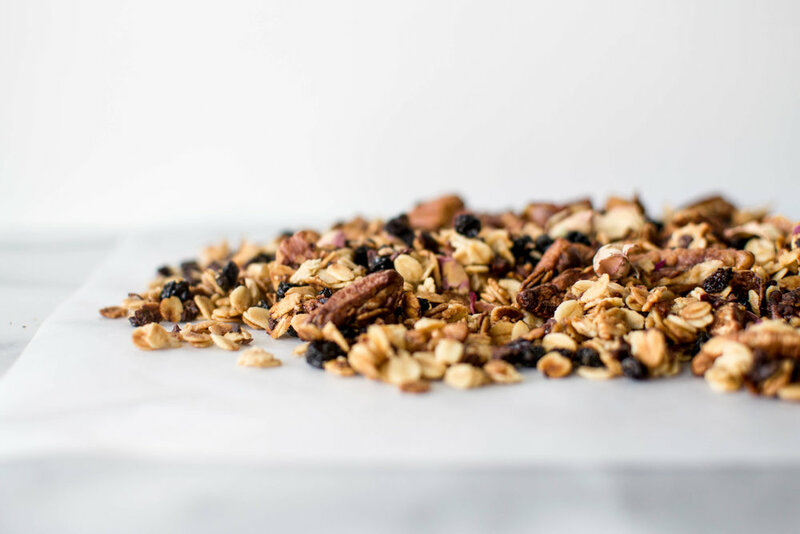 A smidgen of rosewater helps unite all the flavours in this granola into a wonderful blend that just bursts in a mouthful. The recipe is inspired and tweaked to my personal taste preferences from 101 cookbooks. This is a granola from which I could never tire. It has given me a new appreciation for the ritual of breakfast – an important reminder to take time to pause and introduce myself to the many different aromas, textures and flavours that could be considered breakfast. Every morning this week, I have sat down to a bowl of this sweet, floral and nutty breakfast. I cannot get enough. Serve plain, sprinkled over a thick yoghurt or stir it in with a cup of nut milk – either way, it is the perfect breakfast to start off your morning. Preheat the oven to 150 C / 350 F. Line two baking trays with parchment. In a large bowl, combine the rolled oats, pecan halves, salt, cacao nibs, currants and rose petals. Melt the butter and honey together in a small saucepan over a low heat. Remove from the heat and stir in the rose water and vanilla extract. Pour the liquid mixture over the oat mixture and stir until well combined. Stir in the egg white then spread the mixture in a thin layer divided between the two lined baking trays. Bake, rotating trays and stirring a couple of times through baking, for 25 to 35 minutes, or until the granola is toasted and golden brown. Remove from the oven and press down on the granola with a spatula, so that it forms clumps once it cools. Let the granola cool completely, before separating. Serve or store in an airtight container at room temperature.